Figure 1.6 Present distribution of wombats. (a) Northern hairy-nosed wombats are now found only at Epping Forest in Queensland. Two populations near St George probably became extinct early last century. 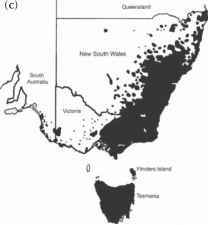 Data source: Crossman (1988) (b) The southern hairy-nosed wombat is found in South Australia with a few small colonies also found in south-western Western Australia. Data source: St John (1998) (c) The approximate range of the bare-nosed wombat. It occurs only in some areas of suitable habitat, avoiding rainforest, for example. Data sources: 'Atlas of Victorian Wildlife', © The State of Victoria, Department of Sustainability and Environment; Atlas of NSW Wildlife, NSW Department of Environment and Climate Change; Department of Primary Industries and Water, Tasmania; K. Mallet and B. Cooke in The Ecology of the Common Wombat in South Australia. by the shrinking of the range of all three wombat species. The northern hairy-nosed wombat is one of Australia's rarest mammals, with only about 135-140 individuals surviving in the last known colony in central Queensland. 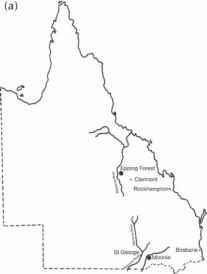 This colony is confined to the Epping Forest National Park, 120 kilometres north-west of Clermont in central Queensland (Figure 1.6a). The southern hairy-nosed wombat is now confined to four main population centres - the Nullarbor Plain, the Eyre Peninsula, the Gawler Ranges and the Murraylands. 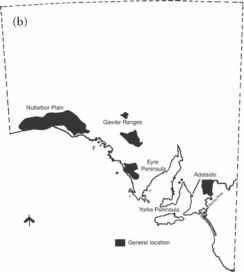 There are also a few isolated colonies on the Yorke Peninsula (Figure 1.6b). The bare-nosed wombat has fared a little better, but it has now almost disappeared from the western half of Victoria and it is absent from all but two of the Bass Strait Islands as well as from many parts of New South Wales where it formerly ranged (Figure 1.6c). It has also declined in South Australia. 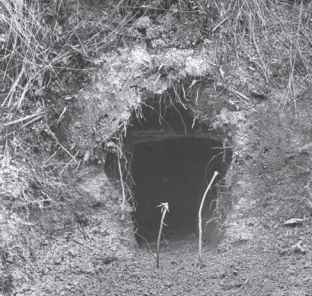 Brian Cooke has investigated this decline and has found that it was probably caused by rabbits. Native pastures were altered to such an extent by these pests that wombats could no longer maintain populations, except in the most favoured parts of their former range. The effect on the wombat of the changes made in the last 200 years, and the impact of Europeans in general, more correctly fall under the heading of 'Disasters', so we will leave them for another chapter.